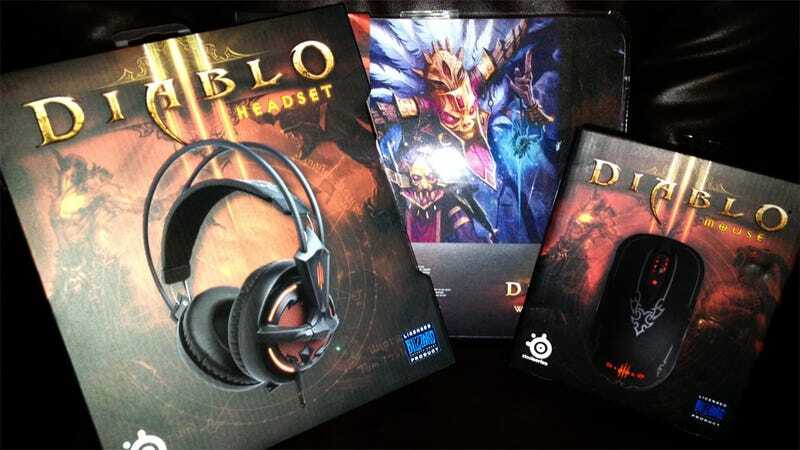 As I prepare to spend Tuesday through eternity putting Diablo III through its paces, SteelSeries sent along a care package of diabolical PC accessories to help make the most of the experience. Red glow abounds! While other manufacturers release their own non-branded peripherals, SteelSeries, a Blizzard partner for a number of years, has the official accessories for the pointing, clicking, listening and mouse-sliding of Diablo III. After posing the packages on the same faux-leather recliner that shall serve as my throne on my dark journey into hell's heart, I actually opened them up and played with the contents. I would have just left them there, but the asses in my household are mighty and powerful. You needed to know that. This lovely little number is a seven-button laser mouse, adjustable up to 5,000 CPI, more CPI than the normal human can possibly withstand. That many counts per inch means that if you move the mouse just a fraction of an inch, your pointer winds up on the monitor of an accountant in Wyoming. Some gamers thrive on this sort of precision. I prefer mine in the 1,000 range. Still, it's nice to have the option should I developer superpowers. Superpowers like being able to withstand 10 million clicks. That's one of SteelSeries' big selling points. They say it's three times more than the average mouse. According to my calculations, that's enough to run through the early Diablo III beta test as a Barbarian 1,102 times. So you should probably buy a case of these. I've used the mouse for several days now and have yet to reach 10 million clicks. I'll keep you all posted. I'm guessing / hoping that on the 10,000,001st click it explodes, taking your hand with it. With seven easily-programmable buttons, configurable illumination and a relatively modest $69.99 price tag, I see no reason why one shouldn't pick up at least one of these for Diablo III. SteelSeries makes a fine mouse. This one glows red. Don't tell SteelSeries, but I've actually had this headset since BlizzCon 2011. The company was there, giving them out left and right, and a friend of mine handed it to me. I took it home and used it faithfully until Razer stole me away with the Tiamat 7.1 Surround Sound headset. Yes it lights up. Yes it has a Diablo III-themed configuration utility that allows players to customize the lighting and equalizer presets. It's got a retractable microphone. It even, if you can believe it, plays sound. Sound, as the back of the box says, with a soundscape specifically designed to enhance the Diablo III experience, though I would be hard-pressed to tell you whether or not that happened. It does all of these things, and does them well, but the most attractive feature of the headset for me is how damn comfortable it is. It's surprisingly light for such an imposing product, and the extra-large ear cups, designed to minimize outside noise, actually cover my giant-sized ears. They're perfect for long-term wear. I hardly noticed them. I might still be wearing them now, and I would never know. The SteelSeries Diablo III headset runs $119.99. If you're in the market for a headset for Diablo III, it would be $119.99 well-spent. Horrible. It was like running my mouse over ground glass. Sorry, always wanted to do that. In reality the Diablo III is a fine cloth-covered mouse surface, large and expansive, festooned with official art and ready to sit underneath your mouse and not make lewd comments when you rub it. Along with a standard Diablo III logo version, the pads come in Barbarian, Witch Doctor, Monk and Demon Hunter. If you are a Wizard, you're out of luck. Take your $14.99 elsewhere, spellcaster, you're not welcome here. And that's the lot. As my Wizard (dammit) slips on his robe, picks up his magical stick, and pops on his hat, I'll be splaying these things across the piece of wood that serves as my recliner desk, waiting anxiously for click 10,000,001 to remove me from the PC game reviewing pool in an impressive explosion of fire, flesh, and bone shards.